Well-known American steamboat devotee Nori Muster tells us where to find a paddle wheel river cruise despite the temporary loss of Delta Queen and all similar vessels.The Delta Queen Steamboat, formerly of the Majestic America Line, is now moored as a boutique hotel at downtown Chattanooga's Coolidge Park Landing. Her sister Majestic paddlewheelers, the American Queen, Mississippi Queen, Empress of the North, and Queen of the West, are also out of service while a financial holding company determines their fate. It may seem like an American tragedy, as though it is now impossible to get out on the water to watch a paddlewheel kick up its wake. The waterfront in Old Town Sacramento is frozen in time. 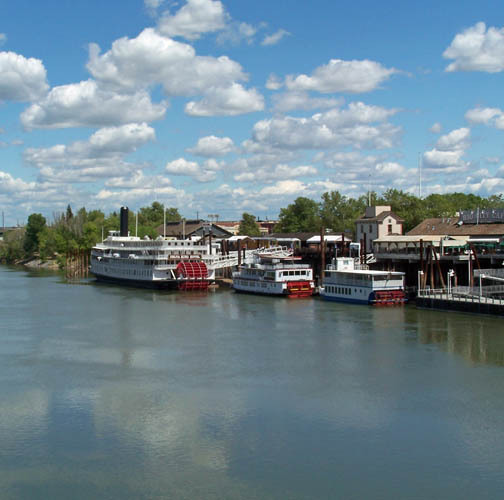 Shown here are the Delta King Hotel, the Spirit of Sacramento, and Island Girl. Traversing the waterways on a paddlewheeler is an American experience that dates back to the eighteenth and nineteenth centuries, when paddlewheelers were as common as busses. They proliferated in such abundance that nobody thought to list all their names. Now we look back on that era with nostalgia, because the paddlewheel boat helped early Americans conquer the rivers and travel upstream to settle in new, unexplored territory. Once there, the pioneers depended on paddlewheelers to bring them life's necessities and export their crops and products. In those days, the technology was primitive and the rivers dangerous. A waterlogged tree under the surface could rise up and stab a boat at its heart, causing it to explode and sink. This is the Spirit of Sacramento as seen from the stern of the Delta King Hotel. When steam trains took over, steamboats began to disappear. Many were captured and destroyed in the Civil War. Almost all were gone by the end of World War II. 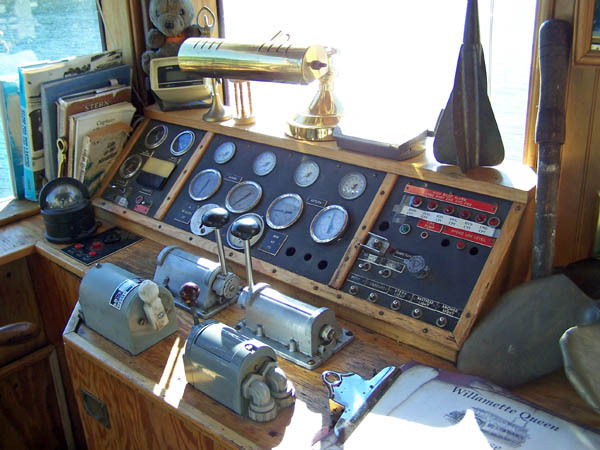 Now, the precious few that remain are pampered and restored, listed as national treasures, and organizations have formed to preserve steamboat history. The technology improved in the twentieth century, so the paddlewheel boats we have today are completely safe. Although several of our most famous paddlewheelers are out of service for now, you can still find operating paddlewheel boats around the bend in nearly every state of the Union.The large cities along the Mississippi River system are hotbeds of paddlewheeler opportunity: Memphis has two sternwheelers, an excursion boat, and a showboat; Cincinnati (and neighboring Newport, Kentucky) have the Belle of Cincinnati, River Queen, and Mark Twain; more boats flourish in Louisville, Marietta, and New Orleans. Northern cities have their steamboats too. Fairbanks has its three Riverboat Discovery paddlewheelers; Baltimore has the Black-Eyed Susan; Detroit has its Princess; and Manhattan has the Paddlewheel Queen. Dubuque, Iowa, on the upper Mississippi, is another center of paddlewheeler activity, and home to the Mississippi River National Museum. Oregon has a long history of paddlewheel steamboats. In the State Capitol, Salem, you can step back in time for a cruise on the Willamette Queen. The boat departs from the Riverfront Park in Downtown Salem for excursions on the Willamette River. Captain Richard Chesbrough, master and owner, has hosted everything from high school classes to state legislators. After retirement, he bought the boat to start a second career. It's a split-wheel paddlewheel boat, which means the stern wheel is in two sections, which can be controlled from the pilot house to steer the boat. The Queen was built in Newport, Oregon, in 1990. 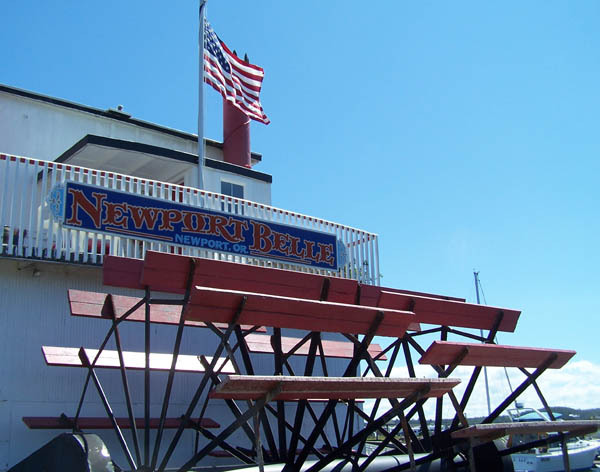 Newport, a small city on the Oregon Coast, is home port of the Newport Belle, a fully operational sternwheeler that serves as a bed and breakfast. Another concentration of paddlewheelers can be found in Old Town Sacramento, home of the Spirit of Sacramento, Island Girl, and Delta King. The Spirit of Sacramento traveled to California under its own power in 1997, following a route from the Gulf of Mexico, through the Panama Canal, and finally under the Golden Gate Bridge to the Sacramento River. Spirit and Island Girl dock next to the Delta King, sister ship of the Delta Queen, which now serves as a floating hotel, convention center, restaurant, and mystery theater. The King sacrificed its mechanical parts to the Delta Queen in 1964, and then sunk for a year and a half in the early 1980s, but is now fully restored to its original beauty. Inside the pilot house of the Willamette Queen, in Salem, Oregon. While numerous paddlewheelers grace our big cities, most of our nation's sweetheart boats are tucked away on small waterways miles from anywhere. For example, you can ride the Dixie Belle under the London Bridge in Lake Havasu, Arizona, half way between Phoenix and Las Vegas. You can drive a hundred and thirty-four miles southeast of Chicago to Webster Lake, Indiana, to catch a ride on the Dixieboat. You can go for an overnight cruise on the Riverboat Twilight in Scales Mound, Illinois, twenty-five miles east of Dubuque. There may be a paddlewheeler near you, or hidden along the route of your next driving vacation. Besides the boats that offer public cruises, bring your binoculars and camera to hunt for smaller, privately owned craft, which operate exclusively for family and friends. The Gambler, out of Rayland, Ohio, is a good example. The owners, Gary and Marilyn Morton said, "This vessel began as a family project in 1983. It was intended to be a learning experience for the boys (nine and eleven) and a chance to develop camaraderie amongst all." Many of the home-made, privately-owned boats are registered with the American Sternwheel Association. They organize regattas and attend tall ships festivals and other riverboat gatherings. Many of the ASA's boats are based in Ohio and West Virginia.Another way to see an authentic paddlewheeler is in a museum exhibit. In Kansas City, Missiouri, the Steamboat Arabia Museum commemorates a sidewheeler that sunk in 1856. The wreck was discovered in 1988 after the river shifted, and a dedicated team of volunteers began to excavate the site. The museum tells the story of the Steamboat Arabia and displays relics recovered from the dig, as well as a full-size recreation of the boat's main deck and one of its sidewheels. The William M. Black was one of four nearly identical sidewheelers built in 1934 as dustpan dredges to operate on the Mississippi River for the U.S. Army Corps of Engineers. The boat retired in 1973 and now serves as a bed and breakfast in Dubuque, fully restored and refitted, as a project of the Mississippi River National Museum. The Newport Belle is a fully operational split wheel sternwheeler in Newport, Oregon, that serves as a bed and breakfast. 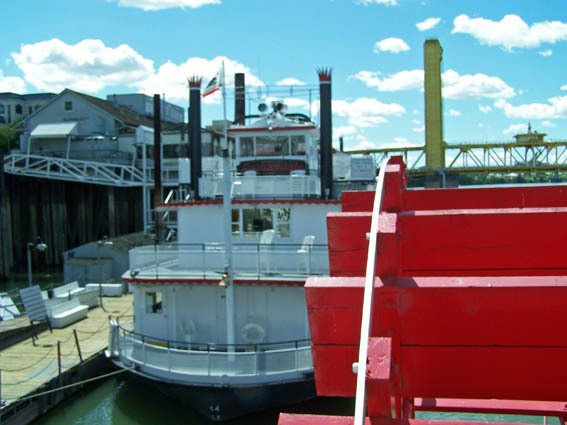 The Barbara H., a registered National Historic Landmark, is a fully operational sternwheel towboat that travels between Cincinnati and Louisville offering dockside tours. It is a project of the Historic Sternwheeler Preservation Society and all tour fees go to support the restoration and continued operation of the boat. With Americans looking for economical travel adventures in these difficult days, paddlewheel boats offer a solution. For the cost of gasoline, a hotel booking, and entry fees to the boats you visit, you can take your family on a journey to discover America. The nation's paddlewheelers are listed at https://steamboats.com/research/50states.html. Many boats require a charter or reservation, so research your trip thoroughly before heading out.